Here's another book hop to get new reads for the summer. This hop is open to all bloggers and authors that would like to participate. Each blog will host it's own giveaway so you can chose what bookish items you would like to give away. The hop will start April 29 at 12:01am central and end at 11:59 pm on May 1. Please make sure that you schedule your posts so that they run on time. 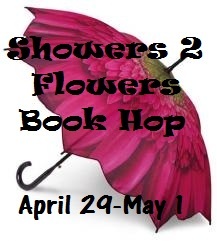 All posts must have the Showers 2 Flowers button (above) in the post and must post the linky list (below) so that others can hop from blog to blog with no problems. Blogs that do not post a giveway on the first day will be deleted from the hop's linky list. To participate, simply sign the linky making sure that you specify if your giveaway will be US Only, US/Can, or International. Then make a post to your blog announcing your participation and put the hop button in your sidebar. Please help us to advertise this hop so that it will be successful. If you have any questions or problems, please comment below, or email us.